In April this year, a team lead by Kenneth Wong from Hong Kong Rotary Club visited 14 schools in Guyuan City (also called Xihaigu region), Ningxia Province of China. One of the team members was a long-term partner and associate of SkyJuice, John Sheen. Located in the southern part of the Ningxia Hui Autonomous Region in Western China, Xihaigu is the collective name for six national poverty-stricken counties. United Nations Food and Agriculture Development Agency determined the area as one of the areas least suitable for human survival in 1972. Xihaigu’s water source is rainwater collected in the low-lying areas. The water collection falls in two categories; “good water” gathered in stone wells and “bad water” in gathered in random small ditches. The increased population together with the scarce water sources puts more strain on the safe sources and results in people collecting water from unsafe sources. To aid the scarce situation, 14 Skyhydrant units were installed in as may schools, providing clean water for total of 39,292 students. First of the Skyhydrants was installed in Guyuan Special School in April 2016. This unit serves the over 2000 students of the school and the encouraging results lead to the installation of further 13 units in May 2018 in different schools throughout the region. We believe that safe, clean drinking water for every school child is not simply doable but as such, a responsibility. 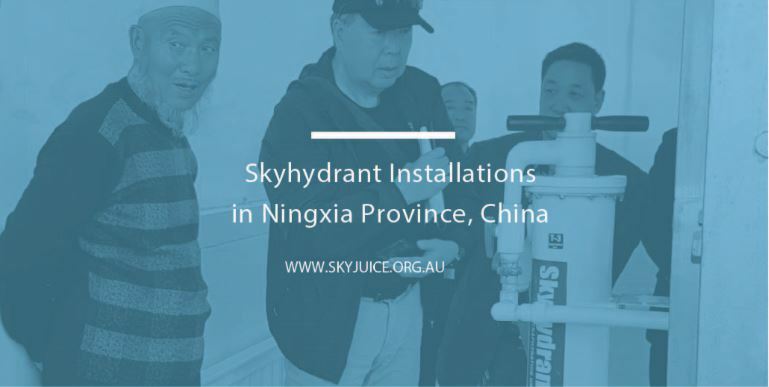 It is through partnerships and projects such as this one in Ningxia Province that makes the process a reality.